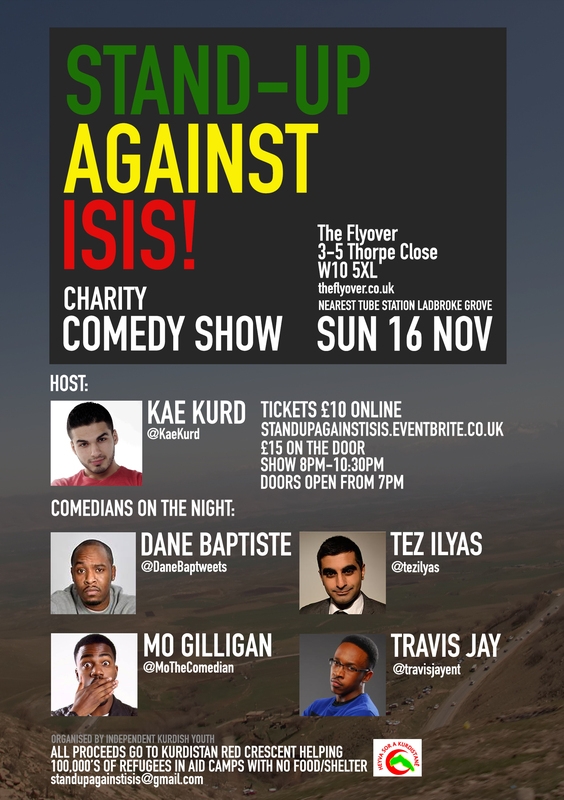 Comedian, Kae Kurd, will host a night of fun-filled laughter accompanied by four UK comedians who are sure to blast you away with jokes. 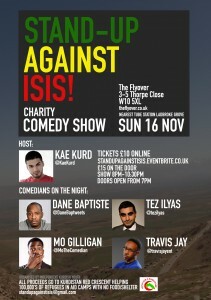 These comedians have united in order to raise money for those affected by the on-going conflict in the Middle East. The evening will be a welcome relief of comedy away from the tragedies that have occurred in the Middle East and give everyone a chance to relax through laughter. Terrible conditions of harsh winter are fast approaching; the millions of innocent people currently residing in refugee camps have been devastated by the actions of terrorists in Iraq and Syria. They are in desperate need of aid and provisions for the oncoming winter season, with 100,000s of people – many old, pregnant, ill and young – all facing freezing temperatures with no food or shelter. They need our help! So book your ticket now to be part of a ground-breaking show, the first of its kind in the Kurdish UK community – and give to a worthy cause. All ticket funds and donations on the night will go towards the Kurdish Red Crescent (Heyva Sor A Kurdistane)! ‘Travis Jay exploded onto the comedy scene in 2009 and has performed in many prestigious comedy venues in the UK. He has sold out a one man show, won the Jumpoff comedy competition 2012 and won the Comedy Store Gang Show in September 2011. ‘Mo Gilligan is a gifted young actor and comedian; boasting a sold-out stand up tour and has performed live at: Hackney Empire, O2 Indigo, Bloomsbury Theatre, Glee, Laughing Horse & Up the Creek. Also appeared on CBBC and BBC Radio 1Xtra’. Tube station: Ladbroke Grove (2 minute walk) – cross at the lights, turn left and turn right under the flyover. The Flyover is 50 metres on the right. Parking: After 5pm you can park in Thorpe Close virtually outside the Flyover. If Washington does not support Kurdish independence, Moscow may.